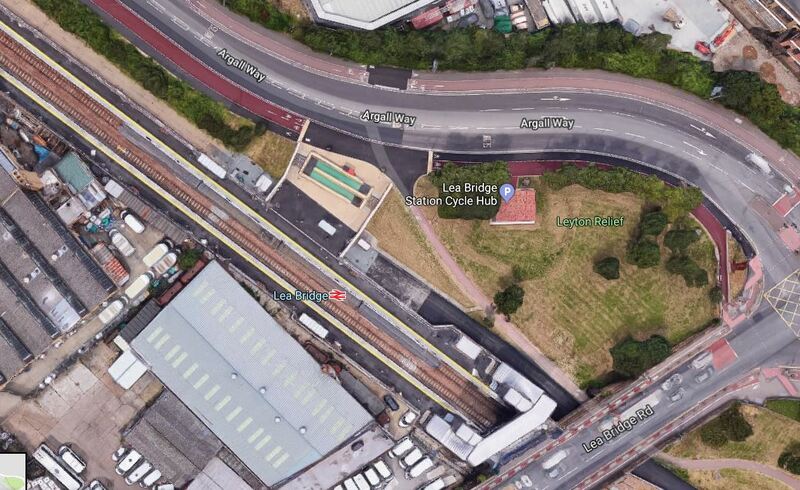 Should There Be A Lea Bridge Road Entrance To Lea Bridge Station? This Google Map shows Lea Bridge station and the access routes to the station. The entrance to the station is from Argall Way, which means that passengers walking to the station from the West along Lea Bridge Roasd have to walk in a circular route to get to the entrance. It must be very galling to see the step-free footbridge, within a metre, as you cross the road bridge over the railway. The road bridge has recently been refurbished and now has a cycleway, as these pictures show. There used to be a bus stop on the road bridge, but that too has been removed and you now have to walk back to the station. 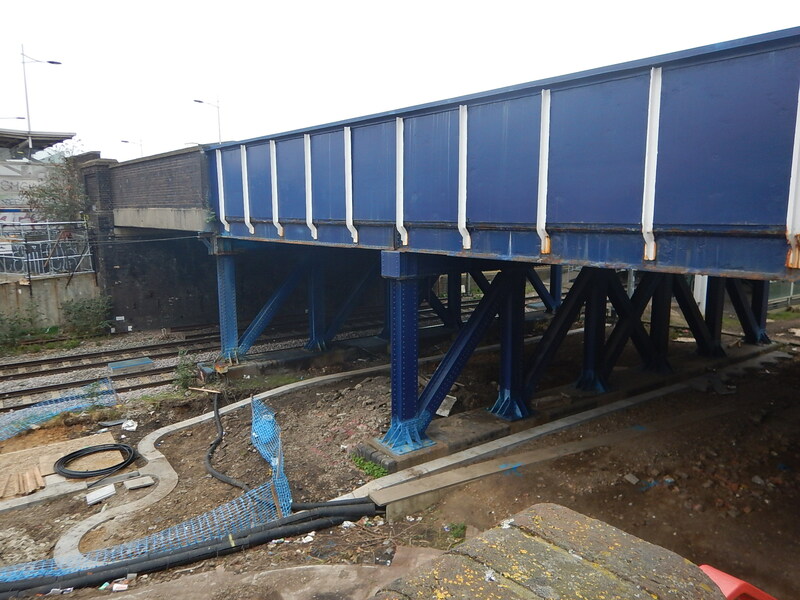 The third track between Northumberland Park and Lea Bridge stations is substantially complete, as these pictures show. Now that the track is laid, it becomes apparent, that with a bit of a squeeze, a fourth track could be laid. Progress also seems to be being made with the overhead gantries. Yet again, there seems to be better performance in electrification, where it is carried out on a new or totally rebuilt line. This may be only a single track, but it is all new, with no buried Victorian unknowns. Steel footbridges, that are so numerous in South Wales, are notable by their rarity and where they do exist, they were raised or built to a safe height, when the West Anglia Main Line was electrified in 1969. This bridge spans both the West Anglia Main Line and the Victoria Line‘s Northumberland Park Depot. I walked across it in March 2017 and there are some pictures in From Tottenham Hale To Northumberland Park. The only bridge that could be a problem, is the road bridge at Tottenham Hale station. It might be possible to squeeze one electrified track underneath. I suspect methods that will be used on the South Wales Metro, that I wrote about in How Can Discontinuous Electrification Be Handled?, could be used to electrify this section. At some point, this bridge looks like it will have to be rebuilt. I walked to the footbridge to the North of Lea Bridge station, before I took a train North. I took some pictures around the bridge and some from the train. Lea Bridge Junction was the old name for the junction and has been shown on carto.metro.free.fr. It would appear there are gaps in the track, so will these be used to put in points to link to possible fourth track or even the Hall Farm Curve, which would link the Chingford Branch Line to Stratford. One thing that puzzles me about Lea Bridge Junction, is that the crossing appears to be unwired. Does this mean that trains will cross using a mixture of Momentum and/or battery power. 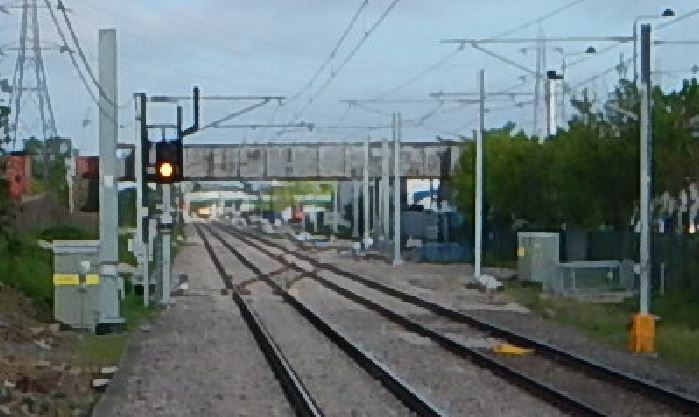 This picture taken from the end of the platform at Lea Bridge station, shows the new connection, that links the third track being built to the Lea Valley Lines though the station. Note how trains going North will be able to join the third track and those coming South can join the track to Stratford. These pictures were taken as I took a train North, a few minutes later. Note the track layout and that nothing is completed yet. This map from carto.metro.free.fr shows the track layout at Lea Bridge station. The original track layout from the 1800s is shown dotted. The original crossover was a double one. Lea Bridge station used to have a third bay platform and space has been left for one. The two parallel tracks originally connected via the Hall Farm Curve to the Chingford Branch. This Google Map shows the area to the East of where the Lea Valley Lines and the Chingford Branch cross. Adding in the curve at a later date would not appear to be compromised, by the current works. With all the troubles caused by the failure of Carillion, it is good to report on a company, that is providing new and improved railway infrastructuresubstantially on time and on budget. This article on Rail Engineer is entitled VolkerFitzpatrick: Upgrading Stations. With Network Rail’s comprehensive Railway Upgrade Plan well underway and the modernisation of Britain’s railways firmly in the spotlight, there is a growing need and expectation for first-class stations and infrastructure to accommodate growing numbers of passengers nationwide. One business with a huge role in the modernisation programme has developed a reputation as an exceptional multi-disciplinary contractor, with extensive capabilities in civil engineering, building and rail, meeting the demands of a wide range of clients across multiple disciplines. It is this consolidated approach that has helped VolkerFitzpatrick deliver several high-profile UK railway station schemes in the last 10 years. The article then goes on to describe how the company tackled the following stations. Hackney Wick – Complete station rebuild for 2018 – The major work is described in A Tough Way To Spend Easter. It then goes on to detail the company’s omvolvement in the Lea Valley Improvement Program, which will deliver new stations at Tottenham Hale, Northumberland Park and Meridian Water. Read the Rail |Engineer article, as it gives a good insight into design and construction. I took these pictures of the works between Lea Bridge and Enfield Lock stations from the 09:06 train from Lea Bridge. Work seems to be progressing. It looks like the area to the South of the Chingford Line is being levelled. The route of the Hall Farm Curve is being cleared. The level crossing at Coppermill Lane has been closed. The bridges are being rebuilt to take at least a single-track. The track-bed appears to be being created. Incidentally, there still isn’t any sign of any overhead line equipment. 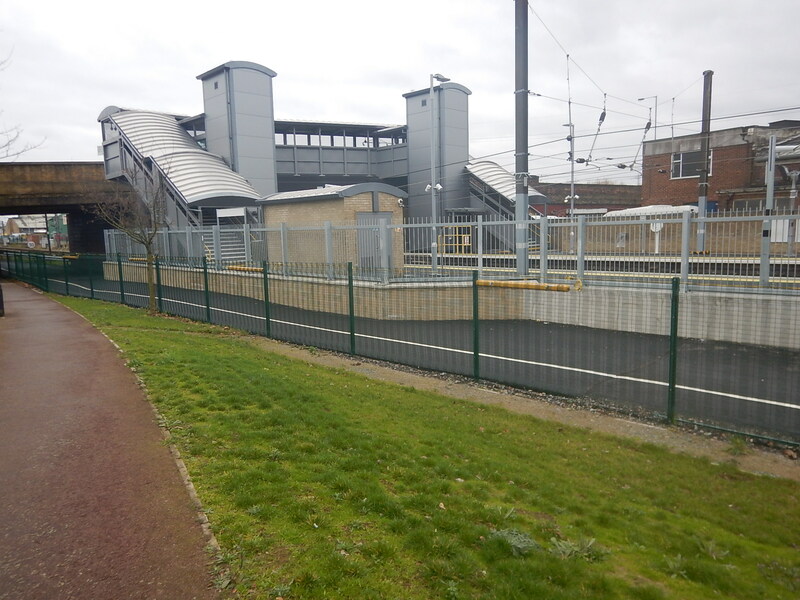 Lea Bridge station opened in May 2016, so as I was investigating the new STAR service, which will call at the station, I took some pictures. These are my thoughts on the station and its design. In some ways the station could be considered a no-frills station, with two simple platforms on either side of double-track line with a bridge at one end. There is none of the following. Anything to stop people walking in. But there is the following. Secure bicycle parking and clearly marked bicycle routes. Several bus routes stopping outside. Shelter from the worst of the weather. Enough driver screens for Driver Only Operation to satisfy reasonable union officials. Clear sound system for announcements. In some ways the station is unusual for one in an inner city area of London. You can imagine a station like this in a rural county like Suffolk or Wiltshire, perhaps with a bit more shelter. I use this station fairly regularly and I’ve never seen any graffiti. Could the lack of graffiti be bacause. There are lots of CCTV cameras. Despite not many trains, there always seems to be passengers around. Anmy graffiti os quickly cleaned away. Stephen Bayley has said that good design discourages graffiti. Whatever the reason is, it seems to work. When I saw it, I wondered why there was a secure walkway inside security fencing at the station. I think it must be so that workers can get from the portable offices a couple of hundred metres South of the station to the various worksites for the STAR project, some of which are North of the station. I wonder when STAR is complete, if the walkway will be converted into a cycle path alongside the railway. A lot of the work at present for the STAR project seems to be moving the cables out of the way and installing a new cable duct. 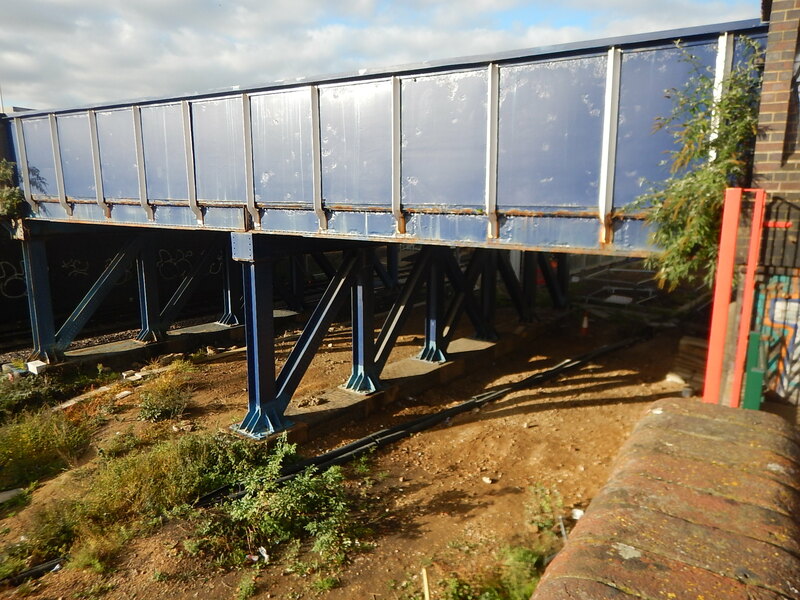 The pictures show the new cable duct coming from the Tottenham Hale direction along the East side of the railway. At the North end of the platforms, the duct disappears and looks like it heads under the railway to continue on the other side. Could this be a deterrent for cable thieves, who now would have to dig up the railway to find them? To the Eastern side of the station behind Platform 1, a space would appear to have been left for a possible bay platform. I have not seen any plans that might need another platform at Lea Bridge station, but if it was absolutely necessary to create one, it wouldn’t be too difficult. Network Rail score high for future p[roofing here, but it would be good, if it was now standard practice, when a new station is built. The March 2017 Edition of Modern Railways sheds some more light on what is happening at the between Angel Road and Tottenham Hale stations. They state the following about the current works. The Stratford area and its station is growing in importance. The line is slated for improvement under the Stratford-Tottenham-Angel Road (STAR) project. STAR will involve laying a third track between Stratford and Angel Road, alongside the West Anglia Main Line and the Temple Mills Branch to Stratford. STAR will be completed at the end of 2018. A picture in the magazine taken from a footbridge shows very much what my pictures show. Crossrail 2 would be overlaid on the existing network serving both Liverpool Street and Stratford stations. 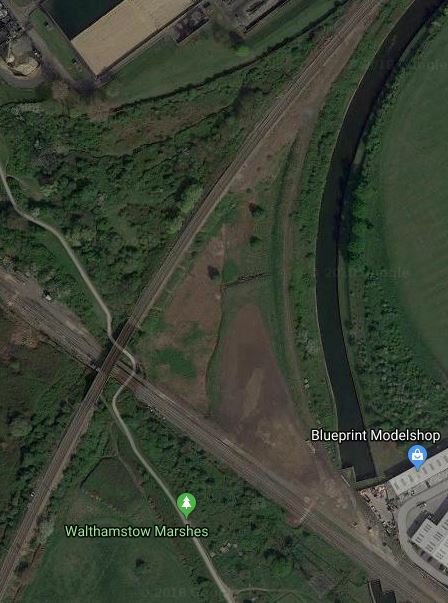 Coppermill junction could be converted to a grade-separated rather than a flat junction. Crossrail 2 would emerge from the tunnel South of Tottenham Hale. The project would quadruple the West Anglia Main Line from the tunnel portal to Broxbourne. STAR would be built to facilitate this. Turnback platforms and stabling sidings are considered at Broxbourne. So how does all this fit with my observations? I very much feel that STAR could be only a stop-gap development until Crossrail 2 arrives. In What Is STAR?, I give a few basic details. After all will it still be needed to run just four tph between Angel Road and Stratford, when there could be upwards of 10-15 tph on Crossrail 2 and other services between Tottenham Hale and Stratford? The timings from Tottenham Hale are currently as follows. Modern Railways states STAR will use a third track between Stratford and Angel Road. So if it was designed to be straight and flat and if it is running new Aventra trains from either London Overground or Greater Anglia with a fast stop capability, I wonder if timings could be achieved, which would enable just two trains to run the required service. But I also suspect that STAR would provide a valuable service to link Meridian Water to Tottenham Hale and Stratford stations, even after Crossrail 2 opens. This picture shows the available space at Tottenham Hale station, which doesn’t appear to be enough for two lines. Note the newly-installed cable ducts. Modern Railways states STAR will use a third track between Stratford and Angel Road. A single track would certainly fit through here. Suppose the current platform 1 on the left, was made an island platform for the existing London-bound line and the track for STAR going along the route that now almost looks like freshly-mowed grass. When Tottenham Hale station is re-built in the near future, Platform 0 will have full step-free access to the Victoria Line, courtesy of Platform 1. It would have cross-platform access to Liverpool Street services on Platform 1. Moving some Stansted or Cambridge service from Liverpool Street to Stratford might be operationally worthwhile after Crossrail opens. Platform usage at Tottenham Hale would be as follows. 0 – All STAR services. 2 – Northbound services except STAR. That would be very logical for passengers and not the most complicated of construction projects. If the third track continued to Angel Road station as seems to be proposed, then a single bay platform could handle the four tph. Space would have to be left for the two future new lines that will be installed, when the full West Anglia four-tracking takes place. The STAR track could be close to the current West Anglia Up Line, as it will be at Tottenham Hale with the two new lines on the Eastern side of the station. If the STAR track was on the outside, there would have to be a flat junction, where the STAR track crossed the two extra lines. Until Crossrail 2 is built, I also suspect that STAR could be only service calling at Angel Road. So there will be a lot of flexibility on how the station is built. 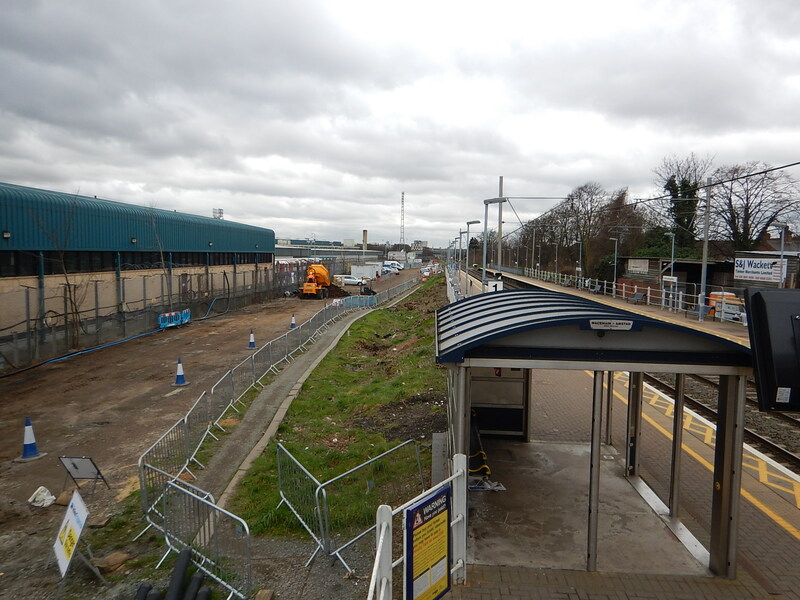 This picture shows the current works at Northumberland Park station. This picture was taken from the footbridge in the station. Could the current platform 1 at the station be converted into an island platform between the current West Anglia Up Line and a STAR track between the West Anglia Main Line and the Northumberland Park Depot for the Victoria Line? I suspect the answer is in the affirmative. There might even be space for more lines through the area, when the West Anglia Main Line is four-tracked. Lea Bridge station is a recently-opened station on the Temple Mills Branch between Tottenham Hale and Stratford and I doubt there is sufficient space for a separate track for STAR with its own platform through the station. The STAR track would have to go through here and would probably mean substantial rebuilding of a brand-new station. So all services to Stratford will call at Platform 1 and all services from Stratford will call at Platform 2. 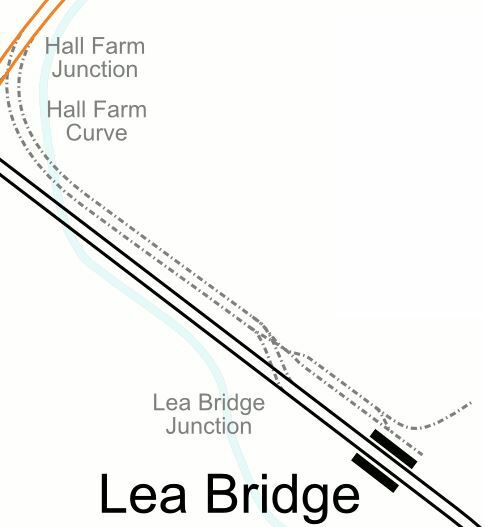 This will mean a junction North of Lea Bridge station, so that services can get themselves to the right lines for Tottenham Hale or in future the Chingford Branch along a rebuilt Hall Farm Curve. Southbound STAR, Chingford Branch Line and other services to Stratford will merge before Lea Bridge station to pass through Platform 1. Northbound STAR and Chingford Branch Line services will pass through Platform 2 and then cross over the Temple Mills Branch Up Line to the bi-directional STAR track alongside the main lines to Tottenham Hale. Northbound Chingford Branch Line services will take the Hall Farm Curve to get to St. James station and the Chingford Branch Line. Other Northbound services from Stratford will stay on the Temple Mills Branch Down Line and go straight to Platform 2 at Tottenham Hale. Traffic crossing from the Temple Mills Branch Down Line over the Up Line to get to the STAR track would include. STAR services of four tph. Services from Stratford to Walthamstow and Chingford, which could be between two and four tph. Due to restrictions on capacity caused by the level crossing at Highams Park station on the Chingford Branch Line, I suspect this could initially be just 2 tph, until a solution for the restriction is found. One possible problem is the capacity at Stratford station, which only has two possible terminal platforms 11 and 12. Platforms like these can generally handle four tph, as they do at stations like Highbury and Islington or Dalston Junction. But is a capacity of eight tph enough if some Stansted and Cambridge services are added to the mix. In High Meads Loop, I look at how an existing loop around Eastfield and Stratford International station could be used to turn trains. This map from carto.metro.free.fr , shows the High Meads Loop. Use of the High Meads Loop would enable the following. Probably upwards of 10-12 tph to be turned back at Stratford. Trains would call in either Platform 11 or 12 at Stratford station. Trains could call at Stratford International station. Currently Platforms 11 and 12 can only handle eight-car trains, but they could be lengthened for the the new 12-car Stadler Flirts, that will work the London to Cambridge and Stansted services in a couple of years. Cambridge, Stansted and Lea Valley services would have simple changes to the following services at Stratford. Crossrail for City and East London, Essex, Heathrow, Paddington and the West End. DLR for Docklands and South East London. European services, if they were to call at Stratford International. As they should! Greater Anglia for Chelmsford, Colchester, Ipswich, Norwich and all the branches. Jubilee Line for Canary Wharf, London Bridge, Waterloo and Westminster. North London Line for Clapham Junction, Old Oak Common and West and South West London. Southeastern Highspeed to Ebbsfleet, Kent and East Sussex. I suspect that London Overground and/or Greater Anglia have a cunning plan to collect all of these services and platforms together in an optimal manner for the benefit of all stakeholders. But it’s really just the East End of London asserting its true place in London’s hierarchy. Using the High Meads Loop at Stratford to turn trains from the West Anglia Main Line could be a big advantage in the next few years. All of these construction projects need to be carried out. Rebuilding of Tottenham Hale station. Four-tracking of the West Anglia Main Line. Lengthening of platforms at Liverpool Street station. Connection of Crossrail 2 to the West Anglia Main Line. If a connection between Tottenham Hale and Stratford via Lea Bridge can be maintained at all times during this massive amount of construction, which given the space available is very possible, then Stratford could be an alternative destination for diverted West Anglia Main Line and local services, that are unable to connect to Liverpool Street. When I first looked at this bridge and saw the height of the overhead electrification on the existing West Anglia Main Line under the far span, I immediately questioned if they could fit the electrification under either of the blue steel bridges, where STAR might pass, in a manner that would meet all the Health and Safety regulations. The only way to electrify and be certain of the safety would be to replace the bridge with a modern structure. But this would take a couple of years and can it be built without closing an important route to and from London for a couple of months? So I come to the conclusion that the STAR line will not be electrified and the line will use electric trains with onboard energy storage or IPEMUs. I have been told by the manufacturer that all Aventra trains are wired for onboard energy storage. Greater Anglia’s Aventras are five-car trains. London Overground’s Class 710 trains are four-car trains. Delivery of London Overground’s trains is scheduled to start in 2018, so they are a just-in-time delivery. The route between Lea Bridge and Stratford is fully electrified, so trains could charge the batteries South of Lea Bridge station. Diesel trains would be an alternative, but probably not appropriate in the Lea Valley. For added safety, the well-proven method of slab track will be used under the bridge to ensure the train stays stable. The outcome will be the ecologically sustainable development of Meridian Water gets appropriate electric trains to shuttle residents to Crossrail and the Eastfield Shopping Centre at Stratford. I shall make a few comments about what the article says about Crossrail 2. How else is there to do it without building a whole new line on a different route up the Lea Valley? Incidentally, plans used to exist for extending the Chingford Branch Line to Stansted Airport through Epping Forest. I doubt that will ever happen, especially as Queen Victoria is supposed to have said no! 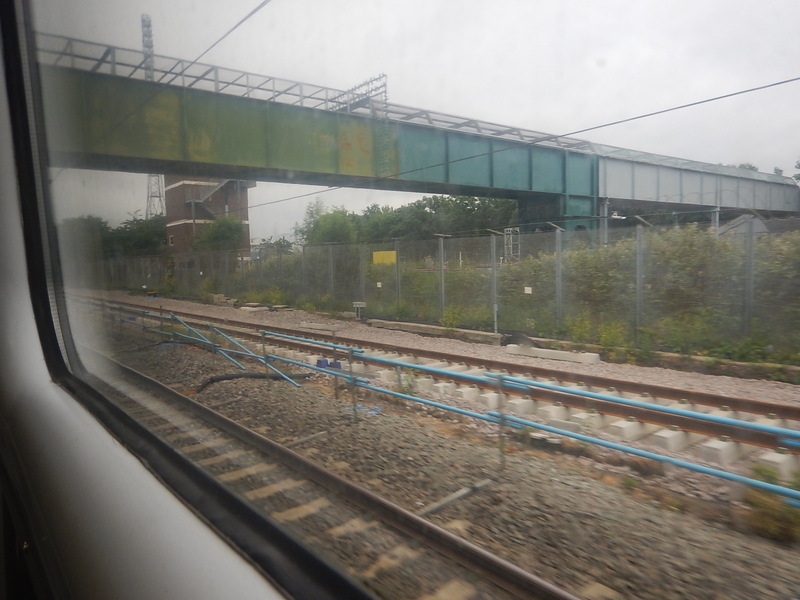 These pictures were taken from a train, that was going from Lea Bridge to Tottenham Hale, through the area of Coppermill Junction. At present the following happens at Coppermill Junction. Trains between Liverpool Street and Chingford pass straight over the junction. Trains from Liverpool Street to Tottenham Hale curve left from the Chingford Branch Line to join the West Anglia Main Line. Trains from Tottenham Hale to Liverpool Street cross in a flat junction over the West Anglia Down Line and the Chingford Branch Down Line to get on track for Liverpool Street. 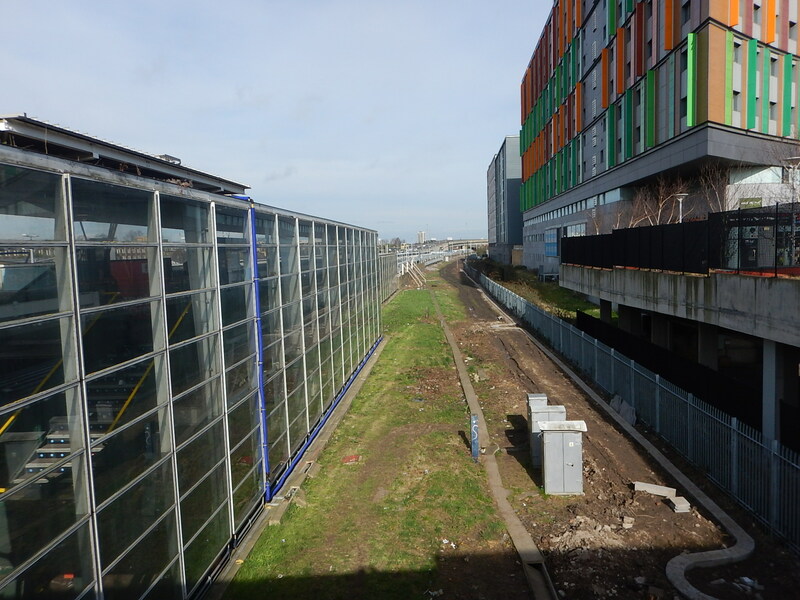 When the West Anglia Main Line has been four-tracked and the STAR track has been inserted alongside the current tracks, the fast tracks will probably be the two most Easterly tracks through Tottenham Hale. This will mean that the West Anglia Up Fast will have to cross the following lines to get on the Chingford Up Line. The double-track of the Temple Mills Branch to Stratford. In the opposite direction, the following tracks will have to be crossed. These movements will need a very complicated Coppermill Junction. As four-tracking is all about faster services between Liverpool Street and Cambridge and Stansted, it would be detrimental to not have an efficient Coppermill Junction, with some grade separation. I think we probably need flyovers or dive-unders on the following routes. West Anglia Up Fast to Chingford Branch Up. Chingford Branch Down to West Anglia Down Fast. Routes would probably need to be provided so that the trains could go between the West Anglia Slow Lines and the Chingford Branch towards London. In addition, I’ve heard rumours that trains will be able to go both ways between Tottenham Hale and Walthamstow/Chingford. There is certainly lots of space to build a complicated junction, as the pictures show. I think that has been known for some time and the possible site is full of London’s demolition rubble. However, the junction with the West Anglia Slow Lines would probably need to be grade separated and integrated with the spaghetti that Coppermill Junction will probably have become. If fast services to Cambridge and Stansted are to be retained, surely this must be done. Just imagine 10-15 Crossrail 2 trains and ten fast trains, every hour sharing a pair of lines up the Lea Valley. In my view the fast lines would be the two most Easterly lines and they probably wouldn’t stop very often, if at all between Liverpool Street or Stratford and Broxbourne. Everything I’ve seen leads me to think, that the single STAR track will be next to the West Anglia and Temple Mills Branch Up Line, with the two new lines outside to the East. I also feel that these new lines will be the fast ones and possibly will have few if any platforms between Tottenham Hale and Broxbourne. STAR could be an independent line, well out of the way operationally of other lines. STAR will be bi-directional North of Lea Bridge station. STAR could share island platforms with the West Anglia Up Line at Angel Road, Northumberland Park and Tottenham Hale stations. There could be no points on the route once it separates North of Lea Bridge station. The fast lines between Liverpool Street and Tottenham Hale could cross the Temple Mills Branch and the STAR line at Coppermill Junction using a flyover. The last point probably explains the grade-separated junction, I mentioned earlier. I said earlier that it could be difficult to put extra tracks through Tottenham Hale station. These pictures show the area, where the STAR line and the two new lines will go and also what lies on the other side in the new housing development of Hale Village. There is more space than I thought earlier. As some of the concrete decking will probably be demolished or modified to build the new entrance and pedestrian bridge for the station, I suspect that the space between the current station and Hale Village can be made wide enough for at least the new lines needed to four-track the West Anglia Main Line. But I suspect that a way will be found to get the STAR line and the two other lines in what space can be created. The STAR service can continue, as long as it’s needed. There certainly wouldn’t be space for platforms on the two other lines between the current station and Hale Village. So as the slow lines will need platforms, the two new lines will be the fast lines. North from Tottenham Hale, there is slightly more space, as my picture at Northumberland Park station showed. As the STAR line is currently planned to terminate at Angel Road station, North from there, the requirement is only the easier one of two tracks and not three. But if the requirement for three tracks should prove too difficult, as the four-tracking will see Crossrail 2 implemented, I’m sure that the STAR line can be sacrificed to make space. But that would create difficulty in maintaining an adequate service between Angel Road and Stratford whilst the four-tracjing is being carried out. In some ways STAR has the feel of one of those temporary diversions you get in road works to keep the traffic moving. Tottenham Hale station is going to be rebuilt. Transport is needed urgently for Meridian Water. STAR connects Angel Road to Stratford with all its connections and Crossrail from 2018. When Crossrail 2 is opened, Angel Road, Northumberland Park and Tottenham Hale stations will have a frequent high capacity service. Greater Anglia might move some Cambridge and Stansted services from Liverpool Street to Stratford. I wouldn’t be sure that STAR would still exist after Crossrail 2 opens. There will be well upwards of ten tph Crossrail 2 trains in both directions calling at Angel Road station. STAR connects Meridian Water with Stratford. STAR gives a four tph connection between Crossrail 2 at Tottenham Hale and Crossrail at Stratford. Passenger numbers and patterns will decide. Tottenham Hale station is being rebuilt and I suspect that if a turnback platform is being considered the station will have provision for the extra platform to be built. This picture shows the Southern end of Platform 2 at the station with the Ferry Lane Bridge behind. It certainly couldn’t be described as good engineering. Connecting the two current platforms is a 1960s bridge, which has steps at both end and a single escalator to bring passengers arriving from the North onto the bridge to walk to the Victoria Line. Plans for the station envisage a lot of work being done before the end of next year. Future in the Wikipedia entry for the station includes these plans. Nothing is said about a turnback platform. But I think if the Ferry Lane Bridge was to be rebuilt and the new station was modified appropriately, the turnback platform could be positioned behind and alongside the current platform 2. It would share step-free access with that provided for platform 2. There would be cross-platform for passengers arriving in the turnback platform, with services going further down the line. The current waiting room would be demolished. There would be space for the platform. Current works at the station are moving the taxi rank, which would help the provision of a turnback platform and other features. 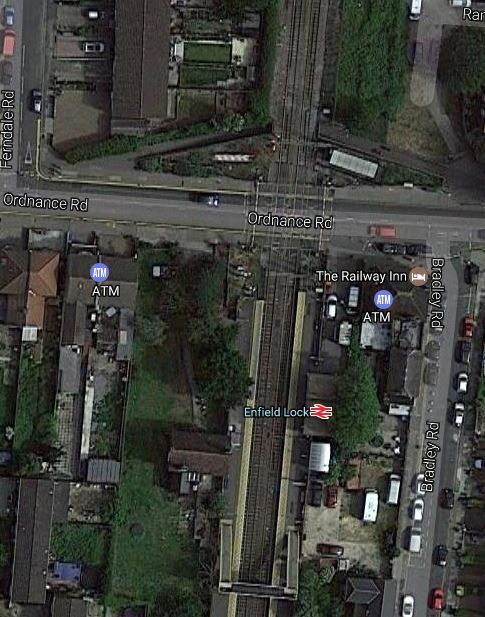 When I looked at Enfield Lock station, I showed this Google Map of Enfield Lock station. Given that there will be two extra lines through the area, will there be any space for a turnback platform? In Level Crossing Issues, I said this. The Southernmost three of these crossings; Enfield Lock, Brimsdown and Northumberland Park, are close to the A1055 which is variously called Meridian Way or Mollison Avenue, which was built to serve the various industrial and residential sites between Tottenham Hale and Waltham Cross. This road should obviously be improved, but look at this Google Map of the Northern End of the road. Note the West Anglia Main Line crossing the map, in a North-South direction. Waltham Cross station is on the other side of the M25. 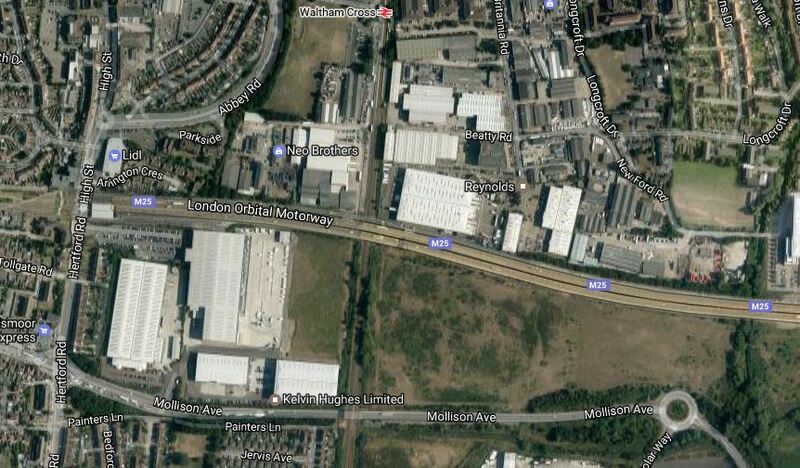 Surely this could be a site for a new Park-and-Ride station for Crossrail 2! 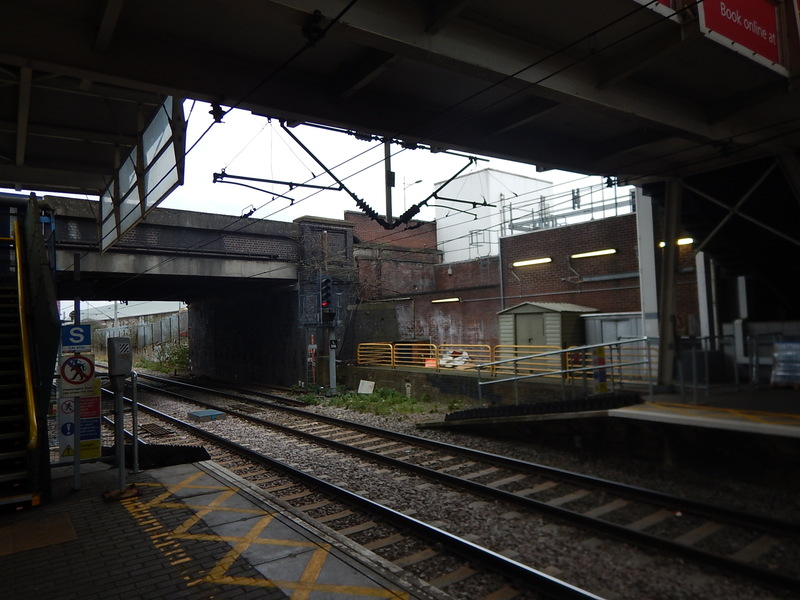 Could this be where the turnback platform at Enfield Lock will be located in a new station? Broxborne station has everything needed to be turned into a superb Northern terminus for Crossrail 2. The station has four platforms; two fast and two slow, with cross-platform change. There is space to add extra through and turnback platforms. There is space for stabling sidings. There is space for masses amounts of parking. The station has a large water feature including the River Lea and the New River. The station is even Grade II Listed. I said more in this post called Broxbourne Station. The final paragraph is. It would not need a massive amount of money to be spent at Broxbourne to make the station a superb Northern terminus for Crossrail 2. It makes Shenfield and Abbey Wood look decidedly second-class now. It is not often that the terminus of a new rail line is so easy to develop. As I have written this post, several questions and issues have suggested themselves. What will be done about the noise of 100 mph plus trains every few minutes on some parts of the route, like through Enfield Lock and Waltham Cross? Could the two new fast lines be placed in a cut-and-cover tunnel through Tottenham Hale? Do any plans exist for the replacement of the Ferry Lane Bridge at Tottenham Hale? 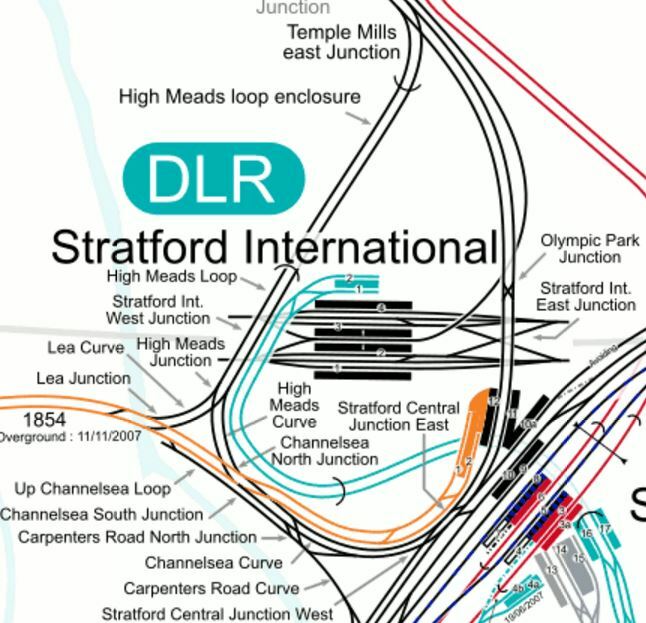 Could the High Meads Loop be used to turn trains at Stratford? Will a station be built on the High Meads Loop to serve Stratford International station? Like Coppermill Junction, it will all get very complicated. STAR, Crossrail 2 and four-tracking the West Anglia Main Line will probably bring a lot of benefits, but it is not a simple project. There is a series of cameras, that display images of the complete train on the screens for the driver. Speakers and CCTV cameras are everywhere along the platforms. Very little seems to have been left to chance. I doubt, even a driver, who was in the midst of some unfortunate personal emergency would miss anything untoward happening on the platform. But even if they collapsed, it would be hoped that other safety systems on the train, would cut the power. As a passenger and engineer, the setup of the platform, certainly reassured me. Should we make sure, that the safety systems at all stations are as comprehensive as this?